My mother-in-law is an entrepreneur. About 25 years ago, after a long career as a journalist, she decided to start out in a totally different direction. She spotted a niche (an agency for booking speakers for conferences, meetings and events) and started her own business, using ingenuity, networking and sales talents, and plain ol’ guts. Her entrepreneurial venture and experience is something I definitely would like to pass on to my girls. Actually, starting up a business or even just learning how to start and manage a business provides extremely beneficial effects – as it exercises and nurtures their creativity, planning and organization skills, patience, persistence and more. 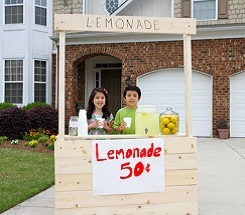 The summer months provide a great opportunity for kids to spread their entrepreneurial wings. They’ll have a set amount of time to run the business, and then can later decide if they have the desire and time to continue over the school year. Time can be productively spent deciding on their business of choice, planning out how it will be run, actually conducting the business, and possibly even earning a little of their own money. Discuss with your child possible business ideas, depending on their age, interests and capabilities. There’s always the classic lemonade stand (my daughter sold her gently used magazines as well at her stand). They can also bake items such as candies, cookies, cakes or cupcakes and sell them at their lemonade/confectioner stands. Other ideas are dog walking, babysitting, pet sitting and gardening. If your child likes making crafts, they can create items such as jewelry, scarves, duct tape bags or wallets. After they’ve decided with you what they want to sell, you can help them organize and prepare through a business plan. What items, training and preparation do they need to get started? How much will it cost and what should the budget be? For example, for a babysitting service, they should probably take a course to get prepared and possibly learn CPR. If they’re going to be making jewelry, how much will it cost to make enough jewelry to sell and how long will it take to make all this jewelry? You can perhaps give your child a business loan that they can pay back incrementally once they start making money, learning the concepts of loans, interest and credit. With entrepreneurial experience, there are a bunch of terrific life lessons they can learn at a young age – they’ll not only gain skills in accounting, planning and organizing but also learn to be patient and steady with their work. Help guide them through the whole business process, and keep a careful eye to make sure they’re not overspending and taking any unnecessary risks. Also, be sure that your kids are safe as they’re conducting business; for instance, young ones should be carefully chaperoned while selling lemonade and your kids should never go door-to-door selling to strangers. Know where your child will be at all times while selling or working. Another fun and teachable aspect of a kid starting his or her own business is the marketing and communications involved. Kids can create their own ads and flyers, and you can help them to distribute these materials around the neighborhood. Your kids can also come up with other promotional ideas to advertise their products or services such as calling and emailing friends and family, and possibly even contacting the local media about their business venture. If your child starts earning money with their business, you can help them decide what to do with it. You can suggest they save most of it in a bank account to earn interest, and then possibly keep saving for a larger item they want to purchase. Or they may want to pick a cause or charity they would like to donate to. This could even also be part of the promotion – people may be more likely to buy the service or products if they know earnings are going toward a good cause. Above all, be involved. They’ll not only need your support and guidance, but most importantly, your encouragement. Keep abreast of how business is going and if it isn’t going well, discuss with your child why it’s possibly not taking off in the way they expected. There may need to be some slight adjustments to the business plan. Be sure to point out to them how most entrepreneurs don’t succeed right away. As exemplified by my mother-in-law’s business, planning and perseverance is crucial. Figuring out a great business idea is one thing, but working on and patiently executing a business plan are another.